Message: The Marriage at Cana by Gaetano Gandolfi, 1776. 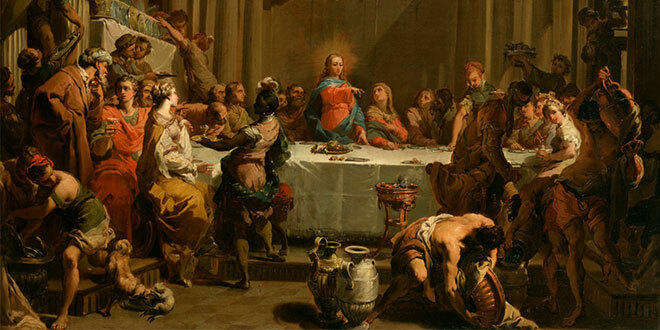 I KNOW many people who visibly wince whenever the ‘Wedding at Cana’ is the Gospel of the day. It is certainly jarring to hear those words spoken by Our Lord to Our Lady – it seems rather rude at first. I know of a priest in South Australia who claims those words as the most memorable in the New Testament, though I think that might have more to do with his own personal experience of them. Apparently when that priest was about fourteen years old he went to Mass and was rather struck by the response of Jesus to His mother. He had to duck rather quickly as the empty milk bottle came flying through the air at his head. As May is a month traditionally committed to Marian devotion, I thought now might be an appropriate time to consider this querulous quip of Our Lord and its possible significance. After all, people who make a habit of addressing their fellow human beings with shouted attributes – ‘Woman!’, ‘Man!’, ‘Boy!’, ‘Girl!’ – are usually given short shrift. Come their birthday they are often presented with books on etiquette or manners by well-meaning relatives. Thus when we see those words in scripture being uttered by the perfect man (Jesus Christ) to the perfect woman (the Blessed Virgin) we ought to suspect a more profound reason than simple irritability or petulance. And the deeper significance behind those words is revealed by a closer examination of the broader sweep of scripture. Who, after all, is the first person in the Bible to be designated by the title, ‘woman’? Yet the most memorable characteristic of the first woman is that she disbelieved the word of the Lord, listened to the serpent and succumbed to temptation, leading – ultimately – to the fall of all mankind. This is to be contrasted with the Blessed Virgin Mary. Mary was immediately responsive to the word of the Lord when it was addressed to her by the angel, leading – ultimately – to the redemption of all mankind. Throughout the centuries, this contrast has often been creatively expressed though art. Eve is often depicted as grasping and reaching; preferring her own will to that of God. By contrast the Blessed Virgin, the handmaid of the Lord, is often painted in a posture of openness and acceptance; ready to respond to grace, wherever it may lead her. In speaking to His own mother as ‘woman’ Christ is in fact openly acknowledging her as the fullest expression of womanhood, as the one whose openness to the grace of God has helped rectify the rejection of that grace by Eve. It is true that as Christians we have but one divine exemplar: He from whom we derive out name – Christ. Yet, employing an image developed by my fellow Dominican Antonin-Gilbert Sertillanges, we can envisage how the Blessed Virgin too functions as a model for us. If we were aboard a boat making its way across the ocean on a crystal-clear night, we would see not only one field of stars, but two: those shining from above would be perfectly reflected by the still sea below. And so it is with Mary – she is a perfect mirror of the light of Christ. And that is why the Blessed Virgin is our true model of faith, not Jesus. Jesus cannot be the subject of Christian faith because He is its object. Nowhere in the New Testament is faith attributed to Jesus. Jesus is the ‘founder and perfecter of faith’ (Hebrews 12:2), the One on whom our faith depends from beginning to end. But He is not one of the believers. Faith is a relation between God and man as person to person, but Jesus is God and man in the same person. He cannot relate to the Father through faith because He relates to Him through nature. Thus our model of faith is His Blessed Mother, Mary. As put so succinctly by the Preacher to the Papal Household, Capuchin Father Raniero Cantalamessa, Mary is, “the first member of the Church in order of time and importance”. At this point, however, I imagine some readers might be inclined to point out that it might well have been easier for the Blessed Virgin to perfectly mirror Our Lord than it is for us – after all, was Mary not preserved from original sin? When it comes to the Immaculate Conception – the dogmatic belief of the Church that Our Lady was conceived without original sin in view of the merits of her Son – an obvious question naturally arises. After all, if God could preserve Mary from the taint of original sin, why does He not simply do that for everyone? Why does He not simply intervene at every conception and preserve us all from the typically troublesome consequences that follow from original sin? No doubt we think that this would make our lives in imitation of Christ a cakewalk in comparison to what we must otherwise face. However, it seems we may well be mistaken in so thinking. I was once discussing this subject with Father Joseph Chua– a Trappist Monk of Tarrawarra Abbey – when he made a rather profound point. The divergence between that which we are as created by God and that which we are in ourselves; the contradiction between the will of the Creator and our empirical being – that is original sin. To say that Our Lady is free from original sin is thus to say that the contradiction between the creature and the Creator – the conflict between God saying ‘Is!’ and us replying in chorus with Adam and Eve, ‘Is not!’– is missing in Mary. The Blessed Virgin stands before God as a pure ‘Yes!’, as a complete affirmation of the will of God. The perfect convergence of divine call and human response: that is freedom from original sin. Preservation from original sin does not thus mean a special competence, or a special achievement. It means simply – and extraordinarily – that Mary reserves no realm of her being, of her life, of her will as purely her own. Rather, in her complete dispossession of herself for God, Mary truly possesses herself. In light of those startling facts, we may need to reassess how easily we would respond to God’s call upon our life if we were provided with the same set of circumstances as the Blessed Virgin. Those words written in the second century continue to exemplify how worthy of devotion the Blessed Virgin remains in our own day and age. Mary is the exemplary woman whose responsiveness to the word of God and to the action of grace earned her the title of ‘Woman’ from her own Son. Mary is the Mother of Church and thus the mother of all who are brothers and sisters in Christ. Mary is the Lady who guides us on our way of faith; the Star of the Sea and mirror of her Divine Son. In this month of May let us be ever mindful that, while Christ is Our Redeemer, He did not appear on this earth at the age of thirty. Mary had to say ‘Yes’ to the incarnation before Christ could say ‘Yes’ to the crucifixion.